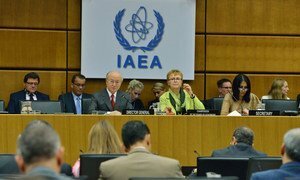 International Atomic Energy Agency (IAEA) Director General Yukiya Amano delivering opening statement to the IAEA’s 59th General Conference in Vienna, Austria. The head of the International Atomic Energy Agency (IAEA) today stressed the importance of science and technology for development, as he highlighted the links between the Sustainable Development Goals that will be adopted by United Nations Member States next week and the work of the Agency. “The IAEA participated actively in the process that led to their development,” Director General Yukiya Amano said in his statement to the opening in Vienna of the Agency’s General Conference, noting areas of convergence such as food security, nutrition, human health and environmental protection, as well as the management of water resources. The 17 Sustainable Development Goals, to be adopted at a special summit to be held in New York from 25 to 27 September, contain specific targets with the aim of ending poverty, protecting the planet and ensuring prosperity for all over the next 15 years. Mr. Amano welcomed the “explicit recognition” in the Goals of the importance of science and technology in advancing development. “I have stressed the importance of science and technology for development since I became Director General and I will continue to do so. The Agency has so much to offer in this area that I often summarise our work as ‘Atoms for Peace and Development.’ We make peaceful nuclear technology available to improve the welfare and prosperity of the people of the world,” he said. In addition, the Director General said many countries believe nuclear power can help them to address the twin challenges of ensuring reliable energy supplies while curbing greenhouse gas emissions. This is one of the issues expected to be discussed at the end of the year when delegates meet in Paris for the UN Climate Change Conference. “Nuclear power is one of the lowest emitters of carbon dioxide among energy sources when emissions through entire life cycles are considered,” Mr. Amano told delegates from the Agency’s 165 member countries. Mr. Amano called on Pyongyang to comply fully with its obligations, to cooperate promptly with the Agency, and to resolve all outstanding issues, including those that have arisen during the absence of Agency’s inspectors from the country. Meanwhile, the Director General recalled that on14 July, Iran and the Agency signed a Road-map for the clarification of past and present outstanding issues regarding the country’s nuclear programme by the end of this year. “As agreed in the Road-map, Iran provided the Agency with explanations in writing, and related documents, for the clarification of the outstanding issues. We reviewed this information and submitted our questions to Iran last week,” he said. This process is taking place under the Joint Comprehensive Plan of Action (JCPOA) recently agreed by Iran and the E3/EU+3 countries – China, France, Germany, Russia, the United Kingdom, and the United States – and which will give the IAEA greater access to information and to sites in Iran. “Iran has also agreed under the JCPOA to implement additional transparency measures, which will help the Agency to have a better understanding of Iran’s nuclear programme,” Mr. Amano added. The Director General also underlined that financial difficulties in many member States are likely to continue in the coming years. He said the Agency will seek to maintain a balance between budgetary constraints and the increasing demand for services from its growing membership. Supporting the achievement of the United Nations Sustainable Development Goals (SDGs) will be a key focus for the International Atomic Energy Agency (IAEA) in years to come, Director General Yukiya Amano told a meeting of the Agency's Board of Governors in Vienna today, where he also provided an update on the application of nuclear safeguards in Iran, Democratic Republic of Korea and Syria.